Sun Princess allows passengers to soak up the sun in various destinations across Hawaii & Tahiti, Asia, Australia and New Zealand. Never miss a moment of scenery while on board the Sun Princess, with 410 balcony staterooms, a winding promenade deck and an atrium with four storeys of beautiful ocean views. 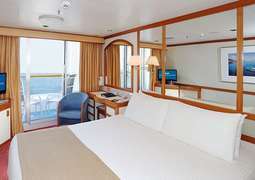 The Sun Princess offers passengers the perfect solution whether travelling as a family or alone. There is a spectacular programme for kids and teens. 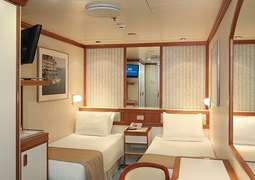 They have their own areas to hang out as well as a host of organized activities such as pajama parties, karaoke and more, ensuring that they too can make the most of their time on board. There are also several dining options tailored for families such as the Swirls ice cream bar, Verdi’s Pizzeria and Terrace BBQ Grill. Food is available on board for all passengers 24 hours a day by room service or in the Horizon Court. Specialty dining is also available at Sterling Steakhouse or Kai Sushi, while Ultimate Balcony Dining is a romantic dining experience with breathtaking views. After dinner try your luck at the Grand Casino or take in a theater show or movie at the Princess theater or the Vista Show Lounge. 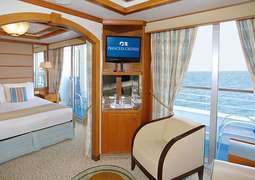 A cruise on board the Sun Princess promises to leave guests fully entertained. Each spacious cabin is luxuriously and comfortably designed and offers more than enough room to stretch out and feel at home. Choose between Inside, Outside and Balcony Cabins or opt for an extra luxurious Suite, where you can enjoy a hot bath in your own tub or relax with a glass of wine on your private balcony. The main restaurant, 'Regency Dining Room', offers a new menu comprised of true culinary delights each day. The foodies on board will be pleased with the specialty restaurants like the 'Sterling Steakhouse' or 'Share' by Curtis Stone, whereas the love birds will enjoy the 'Ultimate Balcony Dining' experience. A special highlight of the Sun Princess is that meal times are not fixed, allowing you to eat when you feel the need. The 24-hour room service is particularly good for late owls and early birds. A journey with a Princess ship should be exciting, entertaining, enriching, and inspirational. The wide variety of offerings in different areas on board helps achieve this goal. Shop to your heart’s content in the designer boutiques. Attend enrichment lectures and presentations. The unique art collections and auctions are some of the finest swimming galleries on the high seas. Catch all the latest films in the cinema or enjoy diverse performances in the 'Princess Theatre' and 'Vista Show Lounge'. Test your luck at the casino, party all night in nightclubs or finish off the day in the comfortable atmosphere of one of the many lounges for fun cocktail hours and cosy wine evenings. A great children’s programme takes place in the 'Fun Zone', 'Kids’ Pool' and 'Teen Centre'. Here different age groups have their own areas to best focus on their individual interests. No matter whether it’s board games, table football or video games, just about everything is possible. Sun Princess will keep you on the run, literally, with basketball, paddle tennis, jogging tracks and state-of-the-art gyms equipped with machines that'll keep your heart rate pumping. Staying fit is no problem. Of course you’re also welcome to spend your holiday relaxing as you please. Let yourself be pampered in the 'Lotus Spa' or wellness room. Pools and whirlpools offer opportunities for both sport and refreshment. The dress code on Sun Princess is generally casual. You are free to wear whatever makes you feel best. However, the dress code becomes smart-casual once the sun goes down, and elegant and formal clothing is recommended for special occasions. Step on board the Sun Princess from Princess Cruises and experience a fabulous cruise experience unlike anything you have before! Able to accommodate 1990 passengers over 14 decks, and a length of 260 meters, the Sun Princess is a ship that will not disappoint. 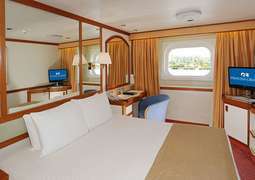 She is most well-known for the high number of balcony staterooms she possesses, which is higher than on other ships and gives you the chance to have a truly pleasurable accommodation experience. She also boasts several new onboard features. The most notable of these is The Sanctuary, an adult’s only zone allowing you to relax completely in beautiful and tranquil surroundings. The Sun Princess now also features Movies under the Stars. A movie being played on a huge screen on the main deck is sure to be an unforgettable experience. The Sun Princess will take you to many stunning locations throughout Asia and Australia. Shop till you drop in Singapore, explore the markets in bustling Hong Kong, discover the history of Port Arthur and get lost in the beauty of many more locations throughout New Zealand, Japan, Vietnam and other locations throughout Asia. Never a dull moment on your holiday with the Sun Princess! On board you will be delighted with the wide range of incredible things to do, see, eat and drink. From the beautifully appointed Atrium, the heart of the ship you can explore all of the fantastic features the Sun Princess has to offer. There are a range of sparkling pools in which to relax in, or for even more relaxation, head to the Lotus Spa and spoil yourself with an indulgent treatment. For something a little more active, take part in one of the various sport activities such as shuffleboard or sweat it out on the sports court. To keep the mind active, there is a library and writing room and a range of Enrichment classes. For art lovers there is a fantastic on board art collection, as well as auctions where you can find that extra special thing with which to remember your time at sea. You could also treat yourself to something at the boutiques on board which have many beautiful things for you to choose from. The range of culinary options on board with surprise and delight you. The two traditional dining rooms, The Regency and the Marquis offer traditional cruise dining with fixed times dining where you can expect the same great service every night. Alternatively you could try one of the specialty restaurants and throughout the day, try one of the great ranges of casual options, such as the Pizzeria or the chance to have traditional afternoon tea. Later in the day you can have a drink at the nautical themed wheelhouse bar, or dance up a storm in the onboard nightclub. Find a great deal with CruiseAway and book your spot on this fabulous ship today! Call our cruise experts today for more details on 1300 887 590.